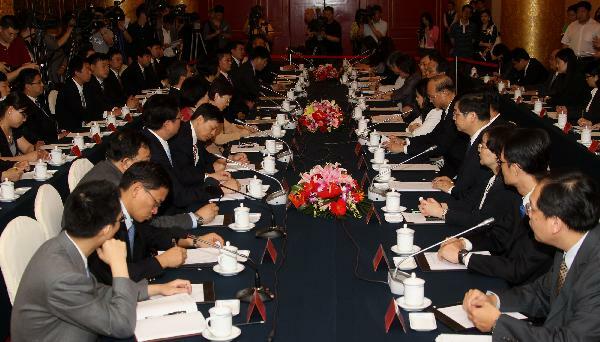 The third round of an expert-level cross-Strait talks on an economic pact is held in Beijing June 13, 2010. Experts from the Chinese mainland and Taiwan Sunday started their third round of talks in Beijing to pave the way for a long-awaited pact to boost cross-Strait economic ties. During the talks, the two sides will discuss the main content of the Economic Cooperation Framework Agreement (ECFA), and goods and services trade in the "early harvest program." (Xinhua/Wang Yongji)BEIJING, June 13 (Xinhua) -- Experts from the Chinese mainland and Taiwan Sunday started their third round of talks in Beijing to pave the way for a long-awaited pact to boost cross-Strait economic ties. During the talks, the two sides discussed the main content of the Economic Cooperation Framework Agreement (ECFA), and goods and services trade in the "early harvest program." A statement released by the talks said that the two sides had exchanged opinions on the ECFA's 16-article text and achieved "substantial progress." The two sides agreed to gradually reduce and abolish obstacles to trade and investment across the Strait based on the principle of equality and mutual benefit. To allow residents on both sides to quickly benefit from the ECFA, the two sides will start to reduce tariffs on some products soon after the agreement takes effect. The ECFA is intended to normalize mainland-Taiwan economic ties and bring the two economies closer. The first round of talks took place in January in Beijing, and the second two months later in Taipei. Fan Liqing, spokeswoman of the State Council's Taiwan Affairs Office, told a press conference Saturday that the negotiations had progressed well and were approaching completion. Yang Yi, another spokesman of the same organization, was reported as saying in March that the two sides should work together to complete the pact in June. Chiang Pin-kung, chairman of Taiwan's Straits Exchange Foundation (SEF), said on April 2 the SEF also hoped to see the signing of the ECFA by the end of June.